Just as in the modern age, where every ambitious builder in New York strove to build an ever higher skyscraper, a vanity that now has spread around the world, the cities of France sought to outdo their rivals with ever bigger and taller cathedrals. During the great cathedral-building craze, the vaults at Laon rose to 79 feet/24 m, those at Paris managed 110 feet/33.5 m, Chartres 114 feet/34.75 m, then 125 feet/38 m at Reims, then another leap to 135 feet/41.2 m at Amiens, and finally Beauvais hit the sky at 157 feet 6 inches/48 m - the only trouble was, they never could quite manage to make it stay up - the winner. iggest, longest, tallest, fattest, a lot of the time it depends on what and how you measure. Outside or inside, a chapel that has been added or that spire anybody can build on top, like a flagpole or aerial on a skyscraper. The Great Pyramid rose to a bit over 145 metres, but has lost about 10 metres as it has eroded down the ages. Various European spires ran up above 150 metres while in France, Rouen topped 150 metres in the 19th century with a cast iron version was added. The age of iron and steel frames was upon us, the Eiffel Tower reaching 320 metres in 1889. But between the pyramids and the age of iron and steel, the cathedrals were the tallest structures in the world. While Beauvais built higher, Amiens built bigger. It is said that Amiens cathedral was able to accommodate the whole 10,000 population of the medieval town. above: Plan of Amiens cathedral. The building’s area is 7,700 m². right: Beauvais cathedral looms over the surrounding streets. The west front of Amiens cathedral is sometimes considered the most perfect and complete gothic facade. My first impression on mounting the parvis of Amiens is almost confusion, with the surfeit of carven stone bodies. I don’t much like crowds, and west front is like a crowd when first seen. It is over time that the more interesting details are gradually comprehended. Left: statues of saints, with Bishop Geoffroy on the right. Around the edge of each gisant (recumbent) statue is a dedication. Here, in ever-breathing balm of fame, rests Everard. Guardian. Whom he could, he recreated with gifts. “Ecce premunt humile Gaufridi membra cubile. “Behold, Geoffrey’s limbs are pressing his humble bed. “The labyrinths of Rheims, Chartres, and Amiens possessed in common a feature which has given rise to much discussion, namely, a figure or figures at the centre representing, it is believed, the architects of the edifices. in the year of incarnation 1288. “Evrard de Fouilloy, 45th bishop of Amiens, placed the first stone of the cathedral of this town in 1220, under the pontificate of Honoré III. The walls had hardly left the ground when he died. Gaudefroy of Eu, his successor, raised the walls from the cobble stones to the vaults. Bishop Arnoult constructed the vaults, the galleries outside and a bell tower, all of which no longer exists. At last, this beautiful edifice was finished in 1288, with the exception of the towers, which for lack of funds, were not finished until the 14th century. “Robert de Lusarches, the most famous architect of the time, drew the plan of the cathedral and started construction. After his death, Thomas de Cormont continued the works and Renault, his son, finished them. The original labyrinth at Amiens was constructed in 1288, being 12.8 metres (42 feet) in diameter. It was destroyed in 1825. The drawing below appears to have been made before that labyrinth's destruction … or maybe not. The current labyrinth, restored in 1894, is in the nave between other tiling. It is 12.1 metres in diameter. The design can be difficult to follow as chairs, billboards and other church clutter tend to be put there willy-nilly. The labyrinth is made from black marble of Basz yellow-white tiles from Lunel. It is known here as the "House of Dedale". However, if you take the drawing by Gailhabaud (a bit above), and reverse it black to white and white to black (similarly to making a negative), and then flip that reversed image left to right, magically it becomes the pattern for the present Amiens labyrinth. However, as you can see, the actual Amiens labyrinth has a redundant and confusing black line surrounding it. The story then becomes stranger still. 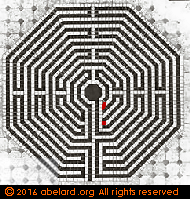 Gailhabaud shows the illustration, left below, for the labyrinth at Saint Quentin. This labyrinth illustration, in fact, corresponds to the actual labyrinth at Amiens (far right in the series above). It does not correspond to the actual labyrinth at Saint Quentin. 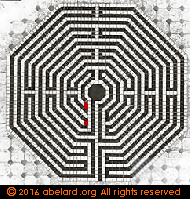 To obtain the actual labyrinth at Saint Quentin, the Gailhabaud drawing must be flipped from left to right! Amiens was near to, though not at, the First World War front line. On 31 August 1914, forward units of the German army entered Amiens, and immediately started their habitual looting and bullying. During this, the Germans also kidnapped about a thousand young men, sending them into captivity. About a week later, they were forced to turn tail as the main German offensive was blocked. They finally left on 17 September (the defeat on the Marne). On 21 March 1918, Ludendorff opened a great offensive with a million troops, in order to break out. He was steadily ground down and stopped, being unable to enter Amiens but, of course, this did not stop the Germans from regularly shelling the town. During this time, the cathedral was hit nine times. Without the Germans in the town, the people of Amiens were able to heavily protect the cathedral inside and out, and to remove the stained glass and other treasures to safety. So while some damage was done to the cathedral, it was minimised. above: the choir stalls protected by sandbagging. The choir (chœur in French) is where the clerics attached to the cathedral’s chapter (or religious hierarchy) gathered during prayers and services. The clerics were not allowed to sit in “the presence of the Lord” and the ceremonies could continue for hours on end. The priests and monks were allowed a concession of a little ledge on which to rest their bottom while appearing to be standing. These ledges are called misericords (also spelt misericorde, misercord = mercy), and were justified by being the location for fancy carving on religious topics or stories from the bible. The choir stalls at Amiens are considered to be among the best anywhere. They certainly are splendid, but I prefer the choir stalls at Auch. They are an extraordinary treasure hidden at the heart of that cathedral, with primitive naive energy, both in the subjects and in their implementation. Two choir stalls at Amiens cathedral with their misericords marked. Misercord showing baby Moses being found in a basket by the river Nile. Feast of Cana carving on the side of a choir stall. The Amiens choir stalls were made between 1495-1530. The artists were Arnould Boulin, Alexandre Huet and Jean Trupin. More images of the stalls are available at princeton.edu. This is the introductory page to Amiens. Many more choir stalls can be viewed via drop-downs on this page. Amiens cathedral has a stained glass collection of shreds and shards ranging over several centuries and several styles. The earliest glass, dating from the 1230s, showed the various artistic fashions in the 13th century. This early glass was the lowest glass in the nave; finished in 1236, but destroyed at the end of the 13th century when the side chapels were built. The few vestiges were scattered in various depots and museums. The majority of this glass was gathered together, organised and conserved in 1830 by the painter and glazier, M.-H. Touzet. The pieces were placed in Bay 27 on the north side. There, they have been reunited in a forced fashion in three lancets, with story compartments, mostly from Genesis, arranged around a central ornamental motif. During the Middle Ages, the wealth of Amiens was based on guède production and dying, becoming the main centre in France. Guède was the French name for woad, a blue dye originating from Isatis tinctoria leaves. More recently, in France, it is usually called pastel. The dye is used for clothing (French Army uniforms and American denim jeans for instance) and paints, among other things. Several Amiens worthies, who had created their wealth through guède manufacture and trade, made donations towards the construction of Amiens cathedral. One of these donors, Andrieu Malherbe donated the glass shown here to the right in 1296 [located in Bay 39]. Malherbe was a rich burger of Amiens. He became mayor [maieur, mayeur] of Amiensin 1292, and died in 1293. His first name was sometimes written as André, and was also shortened to Drieu or Dreux. His wife was called Maroie. His coat of arms carried a fleur-de-lys (semé de France) on a ground of argent, with four azur tortoises. Drieu Malherbe had acquired in 1291, from the chamberlain of King Philippe-le-Bel [1285 - 1314, father of Henry IV of Navarre] for about 1,000 pounds, the right of tonlieu for guaide [guède] in Amiens. In feudal law, the right to tonlieu is a tax levied for the display of merchandise in the markets. It is also a toll levied on goods transported across of a river by bridge or by ferry, or through the gates of the city. Thus Malherbe could collect tolls and levees on the guède traffic and its revenues. These amounted to about 550 pounds a year. Dreux Malherbe, who died in 1295, left in his will to the town of Amiens, this right to collect taxes on guède, which produced a not inconsiderable income and was to be distributed as alms and be used to found two chapels, one in the church of Notre-Dame d'Amiens, the other in the church of Saint-Nicolas and the Poor Clerks. To help protect the cathedral from literally falling apart from the strains generated by building such a large structure that led to it being rather unstable, chains of iron stabilising rods [chaînage, chainage] were added, generally hidden galleries and passages. The building of Amiens cathedral, a huge cathedral only capped in height by Beauvais, was much affected by the then nascent knowledge of structural engineering, and by the ambitions of the builders and the people who commission the construction.The flying buttresses were not always sufficient, or were not placed to apply a counter pressure in the right position to prevent the stone shifting so cracks appear, columns to bow and arches threaten to collapse. To correct the problems that appeared, the builders at Amiens took two main steps. One was adding better positioned buttressing. The original flying buttresses had been placed so their point of reinforcement was too high, and so not effective. Additional buttressing was added later to correct the problem. The original buttressing to the south-east crossing of the transept and nave are among the most beautiful of any cathedral, and were designed to support both the clerestory wall and the high vaults. Unfortunately, the artistry outran the technology. The lower part of the buttress (marked in green) was placed slightly too high to give sufficient support to the vaults, necessitating an added lower reinforcing buttress (marked in red) in some places. The extra buttress somewhat spoiled the original artistic effect. The second method for correcting the cathedral's structural problems was giving the cathedral a girdle, at first in wood. This was later replacd with an iron armature, probably forged at the Abbey of Fortenay. It is a while since I visited Beauvais, and what was seen has become somewhat impressionistic. Beauvais cathedral rises like some volcano or primitive dinosaur that has burst forth from the earth among the houses of the town. The dominant response I have is ‘scary’, and that’s just from the outside. The outside isn’t interesting or very remarkable beyond its great explosion. But go inside, and until recently, you stepped into a threatening cauldron, shorn up by an array of iron and wood. This is the real monster of gothic cathedrals, the choir vault rising to over 46 metres, that’s over 150 feet. This extraordinary elevation is further emphasised by the fact that the nave is so short, having never been completed. There’s no long nave to balance the rocketing height. The cathedral may have survived the WW2 incendiary bombardments that razed much of Beauvais, but this frail stone house of cards is still at the mercy of man and nature. Gale force winds originating from the English Channel oscillate the buttresses and shift the weak roof structure, while sometimes ill-conceived repairs and restorations to the structure. Running from the 1950s to the 1980s, one experiment involved removing many important iron ties from the choir buttresses. This damaging project was thought to have been corrected by temporary ties-and-braces in the 1990s. However, this may have made the building too stiff, so increasing stresses rather than diminishing them. But since 2010, this has changed after major consolidation works were effected, stabilising the heights of the nave. This stabilisation is even leading to the notion that perhaps the tower and spire could be re-erected, this time successfully. The cathedral, with its five-aisled choir abutted by a towered transept, was commissioned by Bishop Milon de Nanteuil in 1225. It was opened in 1272. The vaulting fell in 1284. The tower/spire was completed in 1569. Four little turrets were supported by the four pillars of the transept crossing. The turrets rose from the roof and met a square, open tower forty-eight feet high [14.6 m]. The second tower supported a third stage, over forty-nine feet high [15 m], which was still more lightly traceried. and on them rested the ninety-seven foot high [30 m] wooden needle. The entire spire rose two hundred and fifty-seven feet [78 m] above the roofs of the Cathedral and nearly five hundred feet [152 m] above the ground. The tower fell in 1573. There is no record of what became of the mason! It’s almost a shame to go into details rather than just let the cathedral overwhelm your senses, a bit like discussing the size of the wheels on a roller coaster. If the medieval mind ever wished to put you in awe whilst adding a touch of real-world danger, this is it. The ominous reason that Beauvais was never completed is that the original enthusiasts just could not be quite sure of making it stay up! All the parts in this vast edifice are derived from the equilateral triangle, from the floor plan to the both the overall design and the details of the cross-sections and elevations. Unfortunately, the cathedral of Beauvais was erected with too limited resources and weak materials, as well being provided with a too narrow site. The various messes, stemming from bad work by unskilled workmen, necessitated repair and consolidation work, as well as the doubling of the piers. This last destroyed in great part the truly prodigious impression made by the immense nave, so well conceived theoretically and drawn by a man of genius. Beauvais after German bombing in 1940. The cathedral is in the foreground. Early in June 1940, there was several days of heavy bombing. The Luftwaffe set most of the medieval town alight. Many were killed, while the tapestry industry was devastated and a 42,000 book library burnt out. A great gothic cathedral is akin to a house of cards. The great west front and the marching bays of the nave form a bulwark against the weight of the crossing and, likewise, the apse at the eastern end. Beauvais in its incomplete state is unusual, it has no great west front, no west doors or portals. This is part of why the stability of Beauvais is somewhat dubious. Fortunately, most of the important glass at Beauvais was removed to safety before the devastation caused by National Socialism’s Luftwaffe. The great doors of Beauvais are north and south. Like much of the cathedral, the transepts containing these doors date from the sixteenth century and the two great roses are, therefore, flamboyant. The north rose is sometimes described as a sun, and rises above a series of lancets showing sybils. The south front has two rows of lancets probably representing kings and prophets, and is surmounted by a rose that divides into stories from the Old Testament. It has God at the centre, surrounded by the seven days of creation and then outside that, Adam, Noah, Babel, Abraham and Isaac, Joseph, Moses and the flight from Egypt. At present, I can find no good illustrations for these roses among my photographs, nor on the web. There is generally more academic interest in the medieval glass, from the 13th, 14th and even 15th centuries. For example, there are six very nice thirteenth-century lancets in the apsidal chapel. Their draftsmanship is unusually good. Pictures of two can be seen at the head of the Beauvais section, and a couple more next to this section. The Bible of Amiens by John Ruskin, 1884, chapter 4, p.378. The Bible of Amiens is available on the web as part of a collection. There, it extends from p.273 to p.412. It is also available on paper in reprints (make sure you are buying the full version with four chapters) and secondhand copies. Chapter 4, starting on p.362 of the online version, contains a minute description of the statuary of Amiens cathedral, complete with symbolic meanings. John Ruskin (1819-1900) spent several years in Amiens, referring to Amiens cathedral as the “Parthenon of France”. The great cathedrals are often referred to as ‘bibles in stone’, and here you can see Ruskin’s analysis of the Amiens statuary in that spirit. On the inscription, 1288 is written “Xiij.c ans moins XII”, or “13 hundred years less 12”. Note that on the copper plaque from the cathedral, the Roman numerals are written in the normal way as XIII. The transcription in John Ruskin’s book writes Roman numerals as was commonly done since medieval times, with the final ‘i’ of a number group being written as a ‘j’as a terminator. On medical prescriptions, the terminating ‘j’ helps avoid prescribing errors. Thus, the first ten Roman numerals would be written j, ij, iij, iv, v, vj, vij, viij, ix, x. A visual representation of the genealogy, the family tree, of Jesus. The name ‘Jesse Tree’ comes from the Book of Isaiah 11:1, where Jesus is described as a shoot coming up from the stump of Jesse, the father of David. In stained glass depictions, the tree comes from the side, or the navel, of Jesse lying on a bed. The lineage shown includes the following list, but may be longer, including other ancestors such as Solomon. The characters in the list below of a typical Jesse tree are accompanied by symbols, which may decorate the Jesse tree. Bible sources are also included. Grundriss der Kunstgeschichte , 1864, by Wilhelm Lübke (1826-1893), p.388, fig.227.